‘Matt Maher’s music is a powerful tool to reach young people and we’re so pleased to be welcoming this highly acclaimed artist for the ACYF,’ Archbishop Fisher said. 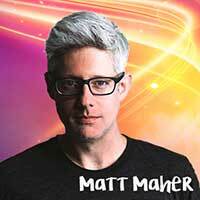 Matt Maher expressed his excitement to be visiting Sydney again. ‘There is a lot happening down under and I can’t wait to get to Sydney with my band for ACYF to celebrate with the young heart of the Church,’ he said. Maher was in Sydney for the World Youth Day in 2008 and at the same time made his major recording label debut with the album Empty and Beautiful. Since then, Maher has become a staple in the artistic and song writing community. Maher was awarded the Songwriter of the Year at the 2015 Gospel Music Association Dove Awards, has been named iTunes Best Christian & Gospel Single and is an eight time Grammy nominee. He has garnered multiple radio successes writing and recording songs like “Lord, I Need You,” “Alive Again,” “Hold Us Together,” “Christ Is Risen,” “All The People Said Amen” and “Your Grace Is Enough”, and released his eighth and latest album entitled, Saints and Sinners. Maher has penned songs recorded by Chris Tomlin, Crowder, Third Day, Matt Redman, Hillsong, Passion and Meredith Andrews, among others. He continues to perform and speak as a part of global high-profile events, including performing on stage with Pope Francis in front of more than 3 million people at World Youth Day in Rio de Janeiro, and at the World Meeting of Families, marking Pope Francis’ first visit to the US in 2015. Many Australian WYD pilgrims remember Maher’s performances at World Youth Day as a particular highlight including at World Youth Day 2016, which took place in Krakow, Poland. The Festival is a youthful and energetic celebration hosted by the Australian Catholic Bishops Conference in partnership with the Archdiocese of Sydney. It will be held from 7-9 December 2017. For more information or to register visit, www.acyf.org.au.